James Joyce - Dubliners. Eveline and The Boarding House. Dubliners Eveline and The Boarding House are stories about women. By looking closely at these stories discuss what Joyce reveals about the role and treatment of women in Dublin society at the turn of the twentieth century. In your answer you should include: * Joyce's presentation of the female characters in these stories. * Their relationships with their male counterparts and their motives for the decisions they make. * The presentation of the theme of paralysis. * The role of women in Joyce's society. When we read Eveline and The Boarding House side by side, we see the main characters straight away as radically different women, and how each one deals with having to make their own way in the same patriarchal society. Joyce presents Eveline and Polly Mooney (along with Mrs Mooney) as almost polar opposites when it comes to their personalities, and the decisions they make, but he uses both characters to clearly express his views on the limited options for women at that time. Along with this, in these stories and in fact the whole of Dubliners, Joyce presents his views on Dublin society in general. He centres on his point "Dublin is the centre of moral paralysis". In these stories along with others he highlights the corruption of Dublin society. Dublin, which was renowned for being a highly religious place, he felt did not practice the Christian values that the church preached. He builds upon this theme of paralysis by presenting it in other ways, some personal to each of the characters, but for a huge part the paralysis of women in general. ...read more. The very first mention of her father in the story was "Her father used often to hunt them in out of the field with his blackthorn stick", which is a very violent reference and could be introducing the theme of domestic abuse. Later on Joyce implies sexual abuse towards Eveline with "he had begun to threaten her and say what he would do to her only for her dead mother's sake. And now she had nobody to protect her". This abusive upbringing would obviously have a startling effect on Eveline. She had watched her mother live a "life of commonplace sacrifices closing in final craziness" and her paralysed life causes her in the end to resign to the same fate. When Frank enters her life he is presented as almost a Christ-like figure as he gives her love and the opportunity of liberation, but Eveline is incapable of understanding the concept of love as it makes her "pleasantly confused". When she talks about leaving she feels sad she is leaving "those she had known all her life" but there is no mention of her leaving those she loved. Frank, to her, was a way to escape, it seems she only learns to like him and sees love only as a possibility. The thought of resigning to a life like her mother's terrifies her, but responsibility and paralysis hold her back from taking the chance of getting what she wants, even what she needs. She made a promise to her mother "to keep the home together as long as she could", and the fact that this responsibility was not passed on to her father just shows us what was expected of women at that time. ...read more. The only way for Polly Mooney, or any woman, to get what she wanted was to use her sexuality, and still then she did not have a voice, socially or politically. Polly would be paralysed by a loveless marriage that only exists on the foundation of manipulation and pregnancy. The memories she has of Mr Doran are only "amiable" and nothing more, which constitutes emotional paralysis. All married women at this time were paralysed by the absence of love. They were institutionalised and had to succumb to the needs of their spouse, practically stripped of all rights. They are also stripped of their identity when they are forced to take their husband's name and are sworn to servitude towards him. As we can see, the characters from these two stories are very different people, and the situations also different. But the conclusion we can draw from both of them is how women were treated in Dublin at this time, and how paralysed this made them. Joyce realises how unjust and immoral this society was, and with these stories he may have been trying to reach out to other people, but these were very controversial statements to be making. He seems to feel sorrow for Eveline, for whom all hope has been lost, and in some ways respectful towards the Mooneys, but perhaps is not behind their lack of morality. In the end this is what women must do at this time to gain anything resembling a fair life, and I personally commend the women like Mrs Mooney who were ready and willing to do what they had to do. ...read more. Is Macbeth a dead Butcher? then deflects by saying "words upon business" "grant the time", he tries to change the flow of the convocation away from the witches by asking if they can talk of other matters. You could therefore say that by deflecting from the truth, Macbeth knows that what he doing is wrong. In Dubliners the stories are linked by the theme of Paralysis. Although this suggests a new beginning, the west is traditionally associated with death and therefore perhaps this story's outcome is just as bleak as the others. Joyce deals with many stages in life throughout Dubliners. His stories focus on children, teenagers, young people and fully grown adults also. Consequently, just as Ireland's native language was hushed, Joyce describes how the voices of his women are muted too, and simultaneously their actions are subject to their male superiors' dictations. 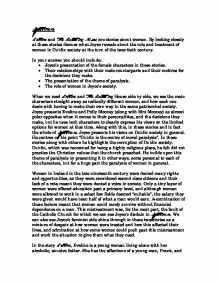 The position of women under masculine dominance in Joyce's stories runs in direct parallel to the political position of Ireland under British dominance. I see my wife crying her lungs out. Near the broken door, the four men are standing and talking to each other. I slowly try to stand up, but one of the men kicked me back to the floor. Then two men came and each hold one of my hand and dragged me outside. to a more positive one, feeling he must pommel and defeat Hector and sacrifice his pride for Patroclus. The room was large and it smelt of sewage, in the corner there were many packs of C4 and lots of ammunition. The other nine terrorists came running at them down the corridor they had just come, "kill them!" Watson slammed the door shut and bolted it. "No problem," he said, waving his bounty at me, "any time." Chapter 4 I decided to visit Ivy's place of death. It was an alleyway, the kind of place where you could easily be knifed. However, the cause of death was a lethal injection of cyanide.